I don’t normally do reviews on my blog so for my first I have decided to review Mother’s Day 2014. 2014 was my third Mother’s Day as an actual mother and yet again Mr Eeh Bah moaned about having to sort things out ‘You’re not my mum’ he repeats every year. Mother’s Day 2014 kicked off in grand style with the perfect present – tickets to see Kate Bush. Obviously this was not left up to chance – a subtle text along the lines of ‘Please buy me tickets or I will break out my teenage Kate Bush dance moves’ did the job. Some things are not worth leaving to chance. I received two cards – one featuring Mummy Pig. Well done darling that’s kind of the point of Mother’s Day. Next year perhaps you could stop saying Happy Birthday. The second card was also wonderful but even less flattering than the card with the pig. It featured a portrait of me drawn by my daughter. Unfortunately I have short brown hair which when combined with a pair of stick on googly eyes gives off a Hitler-esque appearance. I have no reason to think this was intentional. Not to worry my son picked the googly eyes off and ate them. Mother’s Day is all about being appreciated for the little things in life and I’m proud my daughter chose to feature my amazing skill at burning cakes. As an extra bonus after 7 years and 2 children Mr Eeh Bah finally remembered I drink my coffee black, I got to go on a lovely run where I crashed into a bin and my daughter hand rolled 48 meatballs. Apart from the upsetting realisation that I look a bit like a Nazi dictator when drawn by a child Mother’s Day 2014 was pretty awesome and I would recommend it to anyone reading this post. This review is my honest opinion of Mother’s Day 2014 and I have not received any payment for this post ( I’ve not actually seen the Kate Bush tickets yet). If you haven’t already voted in the MAD Blog awards you are seriously missing out. Follow the link below and click on some buttons. I’m a finalist in the Most Entertaining category but other fab, fun blogs are available. 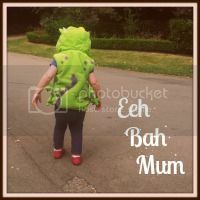 This entry was posted in children, family, humor, review and tagged Kate Bush, Mother's Day 2014, review. eh up! Just voted for you, me duck! I imagine you will be inundated with review requests from other seasonal holidays now. Oooh great review. I’ll bring my popcorn next time! anyone who demands Kate Bush tickets deserves a comment. It doesn’t get any better the older they get (not until they’re at least in their 20s I suspect). My husband went to Amsterdam on a stag weekend so I spent the weekend with my mum where I was stressed out as my step father insists on making my children food with ingredients haphazzardly put together that only a regular at the finest eateries would expect (pasta with truffle sauce anyone?). When we finally got home I got my gift from my girls – a toiletry set that I’d won the previous week at the gym and had wondered where it had got to. I think I will forget father’s day this year! Or maybe go on a girly weekend to Marbella! I take my coffee white. Next time I get a coffee brought to me in bed, I’ll send it on to you. If you could pass the one with milk in it my way, it would be appreciated. Oh, and I looked like a potato on my card. I think Hitler tops it though.